Prime Minister, Narendra Modi meeting the President of the Republic of South Korea, Moon Jae-in, at Hyderabad House, in New Delhi on July 10, 2018. South Korean President Moon Jae-in arrived on his first state visit to India on July 8. His four-day visit (8-11 July) marked the 45th anniversary of establishment of bilateral diplomatic ties. He was accompanied by First Lady Mrs. Kim Jung-Sook, senior ministers of his cabinet (Foreign Minister, Trade Minister and the Minister for Small and Medium Enterprises and Startups), other senior officials and advisors, and large business delegation. 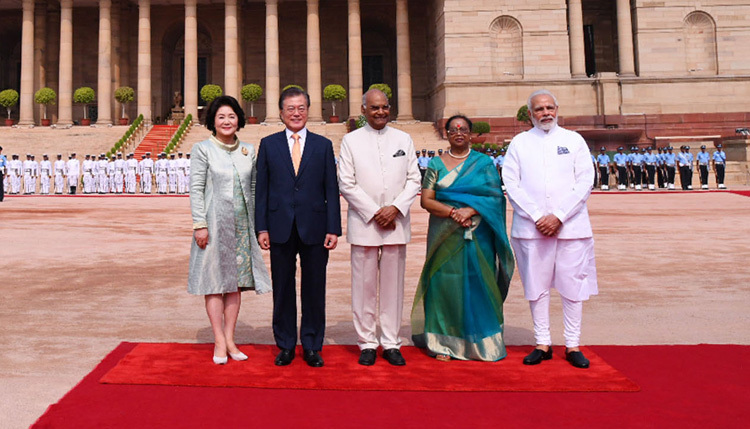 President Moon was accorded ceremonial welcome at Rashtrapati Bhavan. 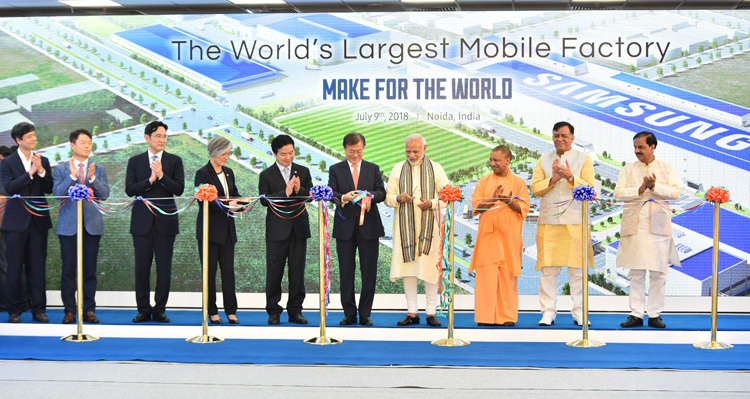 Prime Minister Narendra Modi joined President Moon on a visit to the Gandhi Smriti and then took the metro to Noida to jointly inaugurate the largest Samsung factory in the world; the US$750 million investment is an excellent example of South Korean companies joining the flagship 'Make in India' project. President also visited the Akshardham Temple on the first day of his visit. PM Modi hosted President Moon for restricted level talks followed by delegation level talks at Hyderabad House. The talks were wide ranging including President Moon briefing PM Modi on recent developments in the Korean Peninsula and Modi elaborated on India's vision of the Indo-Pacific which; reiterating what he had stated at the recent Shangri-La Dialogue in Singapore. Modi and Moon addressed the Korea-India Business Forum and jointly heard CEOs of the round table comprising 24 CEOs - 12 from each side. There was recognition from both sides that in spite of $20 billion bilateral trade and more than $6.8 billion Korean investments in India, both are well below potential and much improvement remains priority. President, Ram Nath Kovind and the Prime Minister, Narendra Modi with the President of the Republic of South Korea, Moon Jae-in, at the Ceremonial Reception, at Rashtrapati Bhawan, in New Delhi on July 10, 2018. Between Government of Gujarat and Korea Trade Promotion Agency (KOTRA), and; regarding Queen Suriratna Memorial Project – facilitating upgradation and expansion of existing monument commemorating Princess Suriratna (Queen Hur Hwang-ok), legendary Princess of Ayodhya, who went to Korea in AD 48 and married King Kim-Suro. The Prime Minister, Narendra Modi and the President of the Republic of South Korea, Moon Jae-in jointly inaugurating the Samsung manufacturing plant, World's Largest Mobile Factory, in Noida, Uttar Pradesh on July 09, 2018. The Chief Minister of Uttar Pradesh, Yogi Adityanath, the Minister of State for Culture (I/C) and Environment, Forest & Climate Change, Dr. Mahesh Sharma and other dignitaries are also seen. 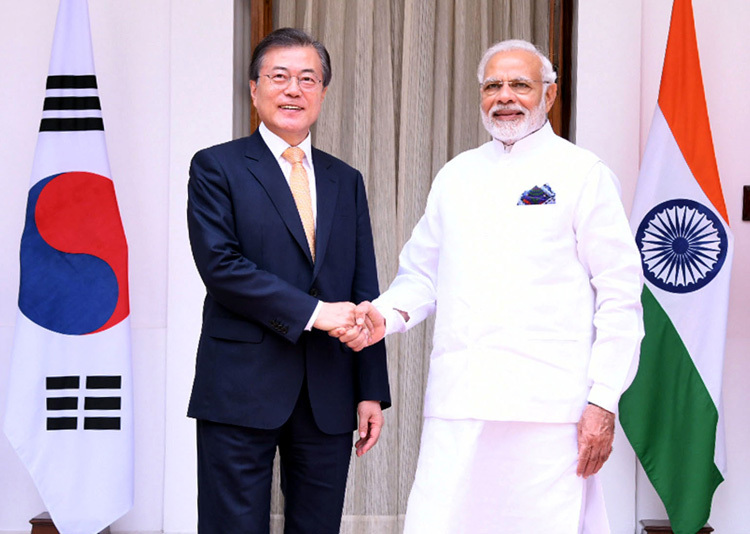 The shared vision of President Moon and PM Modi encapsulated: reaffirming mutual desire to further strengthen the ROK-India 'Special Strategic Partnership' – agreeing to work towards fostering 'future oriented partnership for People, Prosperity and Peace'; India sees ROK as an indispensable partner in its 'Act East' policy, and ROK sees India a central pillar of ROK's 'New Southern Policy' (NSP); expanding existing dialogue mechanisms and exploring other areas; closer people-to-people contacts and commemorating shared historical and cultural heritage; partner each other to secure mutual economic growth and contribute to global economic development; enhance investment, promote joint ventures, and work to raise bilateral trade to US $ 50 billion by 2030; further explore possibilities to coordinate efforts in the defense and strategic spheres for mutual benefit; reaffirm importance of freedom of navigation, over-flight and unimpeded lawful commerce; strengthen existing bilateral dialogue mechanisms on current regional and global issues; condemn terrorism in all forms and manifestations; work together to prevent proliferation of weapons of mass destruction and delivery systems, particularly to terrorists and non-state actors; reaffirmed that India's membership to NSG will strengthen the international non-proliferation regime; work together through joint collaborations in R&D and experience-sharing, to develop technologies for symbiotic development; confidence in establishing 'Korea-India Future Strategy Group' and 'India-Korea Centre for Research and Innovation Cooperation (IKCRI)'. When PM Modi visited South Korea in 2015, the bilateral relationship was upgraded to 'Special Strategic Partnership'. After Moon became President of South Korea in May 2017, PM Modi had met him at the G20 Summit in Hamburg. 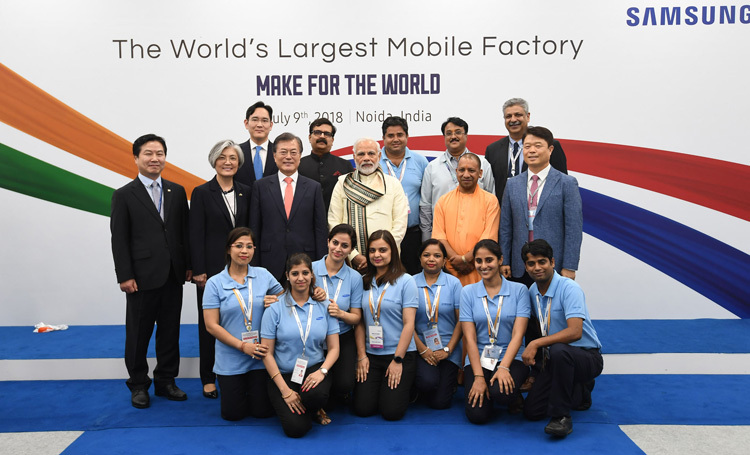 Prime Minister, Narendra Modi and the President of the Republic of South Korea, Moon Jae-in in a group photograph at the inauguration of the Samsung manufacturing plant, World's Largest Mobile Factory, in Noida, Uttar Pradesh on July 09, 2018. The Chief Minister of Uttar Pradesh, Yogi Adityanath and other dignitaries are also seen. Moon's New Southern Policy aims to expand South Korea's outreach to countries outside the immediate region. Some scholars are of the view that while Moon is seeking to diversify South Korea's external portfolio so as to build a more "balanced diplomacy", Moon's NSP is rooted mainly in economic logic whereas India's Act East Policy (EAP) is driven by both geostrategic and geo-economic factors. 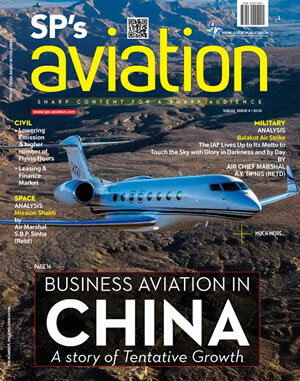 But this may not be entirely true; even though South Korea depends very heavily on the Chinese market that provides Beijing with considerable leverage over Seoul – raising the need for diversification. Coming to India after the surprise beginning of rapprochement between North and South Korea, Moon's visit offers the possibility of strengthening India's role and relevance to the Korean Peninsula. Independent India played an interesting role in the Korean Peninsula in the immediate aftermath of the World War II. India was also among the few countries that maintained diplomatic relations with the North and South during the Cold War. Presently, India is in a position to develop a more strategic view of the Korean Peninsula, as Moon seeks complete reconciliation with the North. It may be recalled that in his presidential election campaign Moon had pledged that that he would elevate Korean ties with India to the level of China, Japan, Russia and the US. South Korean ties with these countries are not purely economic. But looking at the past, despite formal announcement of an India-South Korea Strategic Partnership a decade ago, both countries did not realize the potential Delhi and Seoul have struggled to impart some real content into it. There is great complementary between Korea's New Southern Policy and India's Act East Policy. 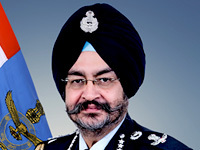 But a lot will depend on the follow up to this upgraded relationship, particularly from the Indian side including for expanding bilateral security and defence cooperation (beyond 'Make in India' projects) and working together with other countries to promote a stable Asian balance of power system. Modi and Moon have a great opportunity now since both are now focused on the Indo-Pacific and there are no contradicting views on other issues as well.